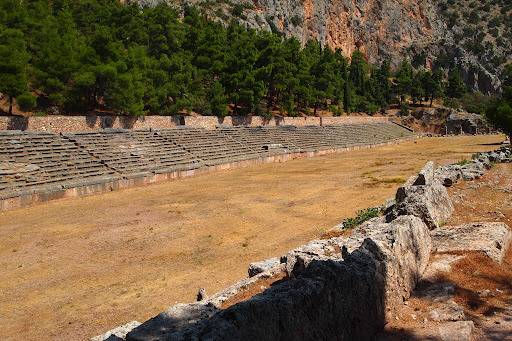 Itea was once the ancient port of the Pan-Hellenic sanctuary of Delphi. After five days in dusty, sweltering Athens getting beside the sea was relief and a half. Itea is a pleasant seasidey town and most of the shops and restaurants are on the strip along the beach. We ate that night at a table on the sand with the water just a few feet away watching the moonrise. After dinner Connor, Grace and I swam out into the black water as a yellow crescent moon started to sink behind the mountains and floated on our backs to watch the stars. We invented our own constellations when we ran out of the real ones we knew, like ‘the giraffe’ and ‘running girl’. The next morning we drove for half an hour until we reached Delphi. 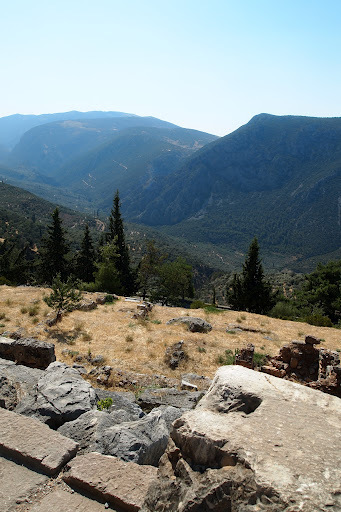 The mountains soured and plunged into the valley below us as we descended the hill to the Temples of Athena and the gymnasium. 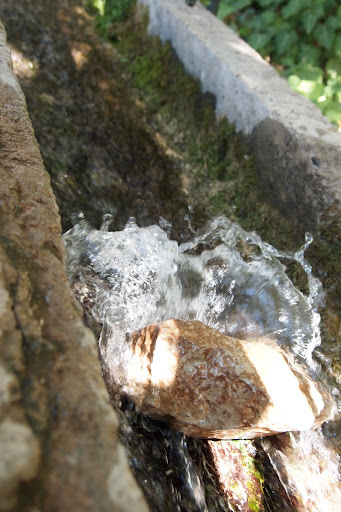 Then up the road again to the Castilian Spring where pilgrims to the oracles and sanctuary of Apollo, which was the main focus of Delphi, were obliged to ritually purify themselves by washing in the water. I drank from the spring but it didn’t cure the sinus infection all the air conditioning had given me. 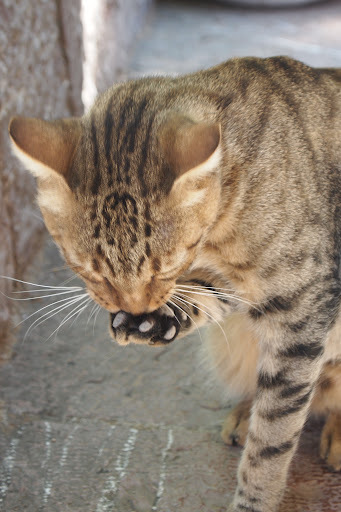 Then we walked to the main entrance and while our tour guide Tom got the tickets we played with the cats. The hill was challenging to say the least but completely worth it. 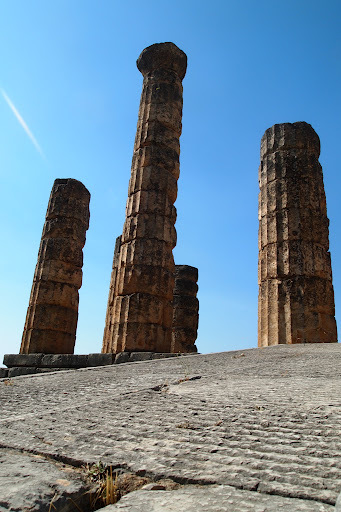 The Temple of Apollo is not very well preserved but even with only a few of its Doric columns left it’s still a dominating presence. This place mattered. It rings with the significance of centuries. Before Apollo­ it’s thought to have been sacred to Gaia. But the heat (41 degrees Celsius) made it a little difficult to focus. 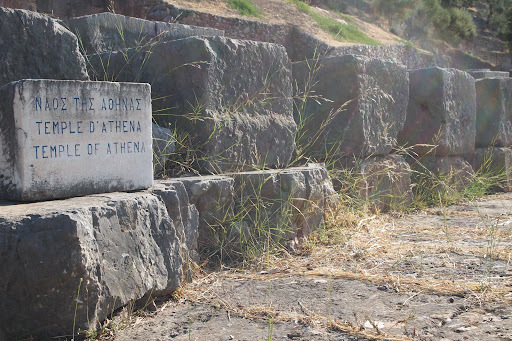 But we made it to the top of the hill where the stadium of the Pythian Games stood. But no one was capable of running, we’d save that for Olympia. 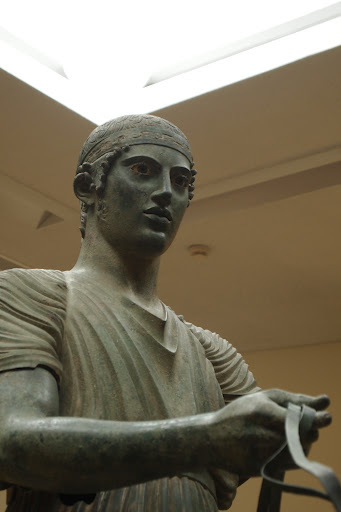 The Delphi Museum is well-worth a visit but don’t buy any of their wildly over-priced drinks (though the cheese pie is pretty good). As you enter up the stairs, tap on the wall. Each block resonates with a different musical note. Then it was back to the bus and Itea for our first afternoon off and the sea called us back again. Though today we noticed some dead jellyfish on the beach. “Ew” I thought. Then we went swimming, had a laugh, before noticing one the size of a hat-box oozing towards us through the water. I have never got out of the sea so fast. As it turns out the sea around Itea is full of giant jellyfish and we hadn’t realised when swimming in it at night, in the pitch black.